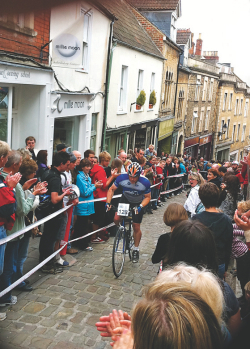 Continental-style passion as Frome starts the hill-climb season with a sprint through its cobbled streets. These autumn months are the traditional season for cycling hill-climbs and most well-established clubs organise at least one timed race up the steepest local hill. The pinnacle of the year for hill-climbing specialists is the National Hill-Climb Championship being promoted this time by the Coventry Cycling Club at Weston-sub-Edge on Sunday, October 31. It was a decidedly non-traditional event that kicked off the season, however, in the town of Frome, Somerset, on September 19. Where most hill-climbs take place in the countryside, the Cobble Wobble was held right in the middle of the ancient town, closing off the narrow, fiercely steep — and cobbled — St Catherine’s Hill so 200 or so competitors, some dressed as Big Bird or Mexican wrestlers, could entertain the townspeople who spilled out from cafes and pubs to shout encouragement. This was the second go at the Cobble Wobble and it looks like becoming an annual fixture. The first was held as part of the celebrations to welcome the 2009 Tour of Britain and was such a success that it seemed a shame, according to the mysterious ‘Black Canon Collective’ that organised it, not to do it all again. The ‘King of the Cobbles’ was Chris Akrigg, a lanky mountain bike trials rider sponsored by Mongoose.